Here are the thank you cards going out to all my lovely customers who ordered with me in January. I love to thank my customers for supporting me and my business. I truly appreciate you and I could not run my business without you! I have used the Botanical Butterfly Designer Series Paper and the Butterfly Duet Punch to punch out the printed butterflies on the paper and colour them using the Stampin’ Blends. You can colour a sheet of butterflies in a jiffy and simply punch them out and stick them to your projects. If you haven’t already got yourself the Butterfly Duet Punch yet you NEED TO BE QUICK. 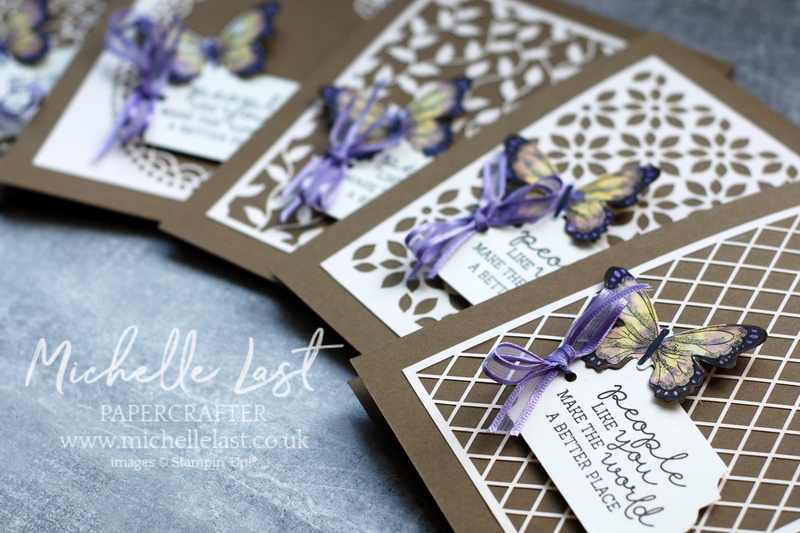 The punch is ALREADY SOLD OUT but if you are QUICK and I mean QUICK you can still order the Butterfly Gala Bundle and get the beautiful stamp set and coordinating punch before the punch is placed on NON-ORDERABLE till new stock arrives at the end of March/beginning of April. I used the beautiful Delightfully Detailed Laser Cut paper for the background. Genius thing about this paper is one side is white and one side is vanilla so you can choose! There is more laser cut paper on page 48 of the seasonal catalogue. I used the everyday label punch to add the greeting to the front of the card using dimensionals. TIP: Did you know that the images in the catalogue are real size so you can punch out a scrap a card and lay it over the images and greetings in the catalogue and see which fit perfectly? I punch a little hole to thread the ribbon using the 1/8″ handheld punch which is not carrying over into the new catalogue. This punch is only available whilst stocks last or until the end of this current Annual Catalogue so if you want a quick handheld punch which punches the perfect sized hole, pop it in your shopping basket and get a sale-a-bration freebie at the same time! Everyone who orders with me receives a handmade thank you card. If you spend £20+ and use the monthly hostess code you also get a thank you gift. I have chosen a lovely item with the earned Stampin’ rewards but I don’t want to ruin the surprise as its not been sent out yet. If you want to place an order for any of the items I have used to make this thank you card, simply click any of the images below to go to my shop and add them to your basket. Don’t forget that for every £45 you spend you can choose a free item from the Sale-a-bration offer. Spend £90 and you can choose one of the higher value free items or two of the items free when you spend £45 etc..
How about becoming a demonstrator? If you spend £150+ please don’t use the monthly hostess code as not only do you get the sale-a-bration freebies but you get at least 10% of the order value to choose in free products. If you are placing a large order, I really encourage you to look at the joining offer as its a wonderful deal, pay £99 and choose £170 worth of any goods of your choice and get on-going deals and discounts. Click here to find out more about joining Stampin Up and purchasing the Starter Kit. If I can help with anything or if you have questions, please do not hesitate to get in touch. Please add the hostess code when ordering online. Many thanks Michelle for the lovely tha k you card. I also received a stamp set called very vintage. It is beautiful but I am a little confused as I hadn’t ordered this. Can you enlighten me please? It is a thank you gift for ordering with me Patricia along with the thank you card. If you place an order with me and spend £20+ you will receive a thank you gift.